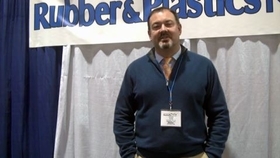 In this video, Steve Dyer talks about Trostel's partnership with GPS Partners for Education. He says it gives his staff a chance to mentor, and provides students with a potential career path related to manufacturing. NASHVILLE, Tenn.―Trostel Ltd. is less than a year into marketing its rubber consulting services, but thus far the Lake Geneva, Wis.-based firm is pleased with the result. The rubber product maker and compounder started this part of its business offerings with the basic mantra, “Bring us your problem, and give us the opportunity to solve it for you,” according to Steven Dyer, Trostel president and CEO. Dyer said the firm has dedicated resources and upgrades in its testing and lab capability into the consulting area, and so far the response has been good. And as more people learn about the services, he's confident they will come to Trostel. Steven Dyer (center) is flanked by Forrest Bush (left) and Joe Houser in staffing the Trostel Ltd. booth at the ACS Rubber Division's Rubber Expo. 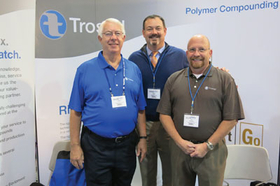 Dyer said the Rubber Expo was the first show where Trostel has brought the consulting services offerings up in its booth as a topic of discussion. There has been some publicity in industry publications, and potential customers have seen it on Trostel's website and in its newsletters. Trostel has a basic menu of services that details what particular tests will cost. Dyer said the firm has benchmarked itself against others in the industry to ensure it is price competitive. Dyer added that as the relationship with a customer begins to evolve, it becomes part of the overall product offering of Trostel. “That is in our relationship and the value add that we bring to the table is access to this technical group from their engineering groups all over the world,” he said. The Trostel CEO relayed one example of where the firm was working with a company's facility in Mexico. But the customer had similar issues with its product line at its European operations, so that led to a couple of trips to Germany to help bring about solutions there. Trostel is by no means trying to be everything to everyone, he said, but merely use its experience with products, processes and applications to solve problems. “Whether it's in appliance or automotive, trucks or oil and gas, they all have very similar issues when it comes down to what the true root cause of a problem is, and our ability is to see them,” the CEO said. Trostel has come out with product lines this year off of prototype tooling at its Technology Center in Lake Geneva after being presented with problems by customers. It has launched two production cells there and later moved those to its main molding facility in Reynosa, Mexico, as order volume dictated, and plans to move two additional programs there over the holidays, he said. Some production, however, will continue to be done at Lake Geneva, Dyer said, especially for customers that want a “Made in the USA” label for its products. “It's morphing from just a technology development and deployment center into a manufacturing center of excellence,” he said. Trostel is projected to show sales growth of 10-12 percent this year and expects similar upward trends for the next couple of years, though Dyer declined to disclose exact sales. For the time being, he said the firm is caught up with “brick and mortar” expansion projects but is concentrating on adding to its engineering staff.